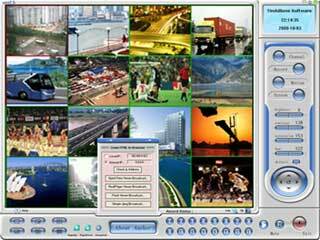 H264 WebCam Free is a 4-channel h264 remote video surveillance software for Windows. H264 WebCam Free has an advanced video motion detection algorithm. H264 WebCam Free can handle up to 4-channels of video input and 4-channels of audio input, capturing images at up to 30 frames per second from directly connected cameras (both USB and analog), TV boards, capture cards, network ip camera etc. JPEG image snapshots can be made from video images. ...... with low bandwidth needs. JPEG image snapshots can be made from video images along with detailed log files. H264 WebCam Free software also includes its own help files. Other features include secure Login with a valid user ID and password required for network based access and it can automatically restore the network connection if the network link is lost during a monitoring session. This feature rich software can be used as a stand-alone product or the centerpiece for building a powerful surveillance client. H264 WebCam Free is 100% freeware for you. What's new of H264 WebCam Free 3.9? * Add the client viewer number to 50 . * Add Sony Net Camera preset function. * Add Foscam H.264 IP camera supporting. * Add two DDNS supporting, including dynddns.us and changeip.org DDNS . * Add 3S vision IP camera supporting. * Add Esky network camera supporting. Qweas is providing links to H264 WebCam Free 3.9 as a courtesy, and makes no representations regarding H264 WebCam Free or any other applications or any information related thereto. Any questions, complaints or claims regarding this application H264 WebCam Free 3.9 must be directed to the appropriate software vendor. You may click the publisher link of H264 WebCam Free on the top of this page to get more details about the vendor.